In a world of uncertainty, pain, and struggle, where do you go to find solid and steadfast assurance? Gifted Women of Faith® speaker Sheila Walsh offers powerful, heart-filled teaching on ten bedrock promises of God, providing the foundation for daily living with confidence, hope, and joy. Sheila unveils principles that provide unshakable security during even the most difficult times by weaving her hallmark storytelling, personal experiences, and applicable Scripture to help readers gain a trust in God that will sustain them for a lifetime. You can WIN a copy of your VERY own~!! 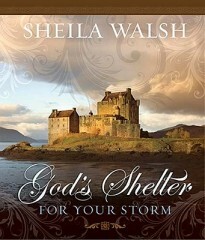 Mandatory Entry - Visit http://www.sheilawalsh.com/shelter/ and tell me something you learned from her video. Giveaway begins Saturday July 9th and ends on Saturday, July 23rd midnight (EST). This contest is open to the CANADA and US. The winner will be selected at random.org and then announced on One Day At A Time and contacted via email. The winner will then have 48 hours to respond before a new winner is selected. God's promises are built on the firm foundation of who God is. He is truth, and He cannot lie. We can trust in His promises! I learned that there are over 3000 promises in the Bible! I learned His shelter can be as simple as an umbrella. I'd love to win. Thank you for a chance. I learned that His shelter could be something so simple that we don't even think about.